The U.S. Senate is a curious, unique legislative body for a lot of reasons. It has arcane rules, such as the filibuster, which limits the passage of most legislative items unless 60 members vote yes. 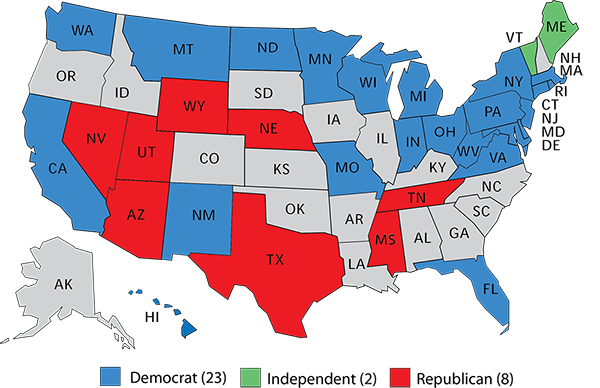 Representation in the Senate is not based on population; instead, each state gets two and only two senators, meaning that California (the most populous state) and Wyoming (the least populous) have equal say in the Senate. Each get 2% of the Senate's membership -- two out of 100 senators -- even though California has 12% of the nation's people while Wyoming only has 0.2%. And unlike the House, where the entire membership is on the ballot every two years, only a third of the Senate's membership is on the ballot each federal election cycle. A telling sign of the Democratic Party's challenge in the next Senate election is that slightly more than half of the party's current caucus, 25 of the 48 members, are on the ballot next year. So even though only a third of the nation's 100 Senate seats are regularly scheduled for election every two years, a majority of the entire Democratic caucus has to run next year. Meanwhile, just eight of the 52 Senate Republicans will be on the ballot next year, or 15% of the GOP caucus. So the current party control of 2018's Senate Class I 1 is 25-8 Democratic. Democrats have managed to net seats on this map in each of the last three elections, adding four in 2000, an additional six to flip control of the upper chamber in 2006, and then two more in 2012 when most expected them to lose net seats because of the sheer volume of ground they were defending. The last good Republican performance in Class I's elections was 1994, when the GOP netted eight seats and flipped the Senate. When a party does as well on a Senate map as the Democrats have on this one over several cycles, they eventually crash, although the rhythms of midterm elections and the president's poor approval rating could put off that crash for at least another six years. Or not. We've written 2 extensively 3 about 4 next year's Senate elections already, and we don't want to cover the same ground here. Whatever does happen next year, though, Republicans have much more ground to defend over the next two Senate elections, but they are not as vulnerable as they may seem at first blush. Given the imbalance of Senate Class I, it's not a shock that Senate Classes II and III, which will next be on the ballot, are imbalanced as well, but instead in favor of the Republicans. Let's look at them in order. Senate Class II 5, last on the ballot in 2014 and up again in 2020's presidential election, features 22 Republicans and 11 Democrats. This map has flipped twice in the last two election, first cementing and then dismantling a Democratic Senate majority. Republicans netted two seats apiece in 1996 and 2002 to build a 21-12 edge in Class II, a precarious advantage that flipped to 20-13 Democratic as they picked up eight seats amidst Barack Obama's first presidential victory in 2008. That turned a slim 51-49 Democratic Senate majority into a 59-41 advantage that grew to 60-40 with Pennsylvania Sen. Arlen Specter's party switch, although the contested election of Sen. Al Franken (D-MN), who wasn't seated until July 2009, followed by the death of Sen. Ted Kennedy (D-MA) and Scott Brown's (R) subsequent upset victory in the special election to replace Kennedy in early 2010 limited the Democrats' filibuster-proof majority to just several months. Democrats held the Senate in the 2010 and 2012 elections, but their nine-seat net loss on 2014's Class II map led to the GOP taking a 54-46 majority starting in 2015, a majority they continue to hold (albeit two seats weaker after 2016) now. 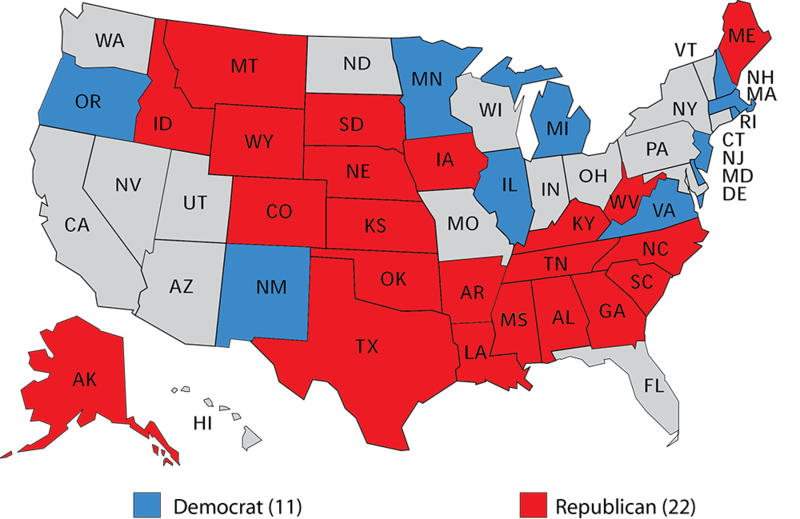 In flipping the Senate in 2014, Republicans beat Democrats in several states that are very Republican at the presidential level. So while first-term Republicans dot the map, they represent some deep red territory that even a weakened President Trump running for reelection, or another Republican candidate, should be able to carry comfortably in the presidential election: Alaska, Arkansas, Louisiana, Montana, South Dakota, and West Virginia. Whoever wins the December special election in Alabama -- probably lightning rod Republican Roy Moore -- will also be back on the ballot in this election. With a different occupant in the White House than Barack Obama, perhaps Democrats can field credible challengers in these states, but none of these states are trending Democratic. 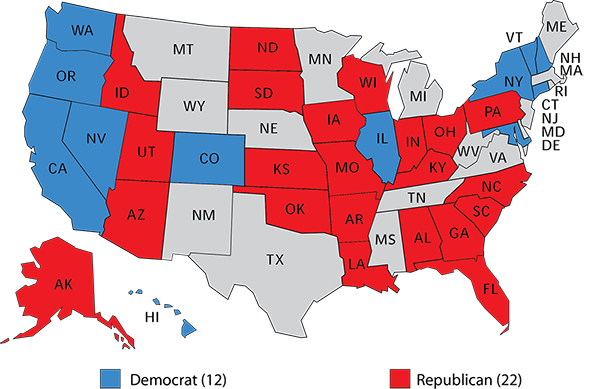 Add it all up, and Democrats might be favored to make a modest net gain on this Senate map to start the 2020 cycle, but the Republicans do not start with a glaring handicap even though they already control two-thirds of the seats being contested. One other thing about Class II 6: Just by chance, its 33 senators represent only about half of the nation's population, while the other two feature senators who represent around three-quarters apiece. The reason is that Class II does not include five of the seven most populous states: California (1st in population), Florida (3rd), New York (4th), Pennsylvania (6th), and Ohio (7th). Moving to 2022, the Republicans again will be playing more defense than offense in all likelihood because they already hold a 22-12 edge in Senate Class III 7. Democrats hoped to ride anti-Trump coattails to a Senate majority on this map last year, but their gains were confined to just Illinois and New Hampshire, where Democratic Senate candidates (and Hillary Clinton) chalked up wins. And, because 2016 was the first election ever where each state with a Senate election supported the same party for president and for Senate 8, at this point neither party has to defend a Senate seat in 2022 won by the other party at the presidential level. However, that could easily change after the 2020 presidential election: No two consecutive presidential elections have ever featured the exact same Electoral College map, though many have been quite similar (a recent example: Barack Obama only lost two states, Indiana and North Carolina, from his 2008 map in 2012). Still, one would expect at least one or more states to switch their presidential allegiance one way or the other in 2020. The next election of Senate Class III might as well be a political generation away -- we have another presidential election before then, and as we've noted many times before, whichever party holds the White House has to fight through a typical midterm penalty -- but it stands to reason that some of the states that were very competitive in 2016 would be again in 2022's midterm election. Democrats likely would have to put resources into defending Colorado, Nevada, and New Hampshire, while Republicans would have a longer list of potentially vulnerable states: Florida, North Carolina, Ohio, Pennsylvania, and Wisconsin (Sen. Ron Johnson has already indicated he will not run for a third term) are all possibilities, and other seats may become competitive if some long-serving senators do not run for new terms, like Arizona's John McCain (who currently is fighting a very serious form of brain cancer) as well as other senior members like Georgia's Johnny Isakson and Iowa's Chuck Grassley. Again, one could probably say the same thing about 2022 as one could say about 2020: Republicans would be overextended but Democrats wouldn't be guaranteed anything. That speaks to the GOP advantage in the Senate right now. Even though Trump lost the popular vote by two percentage points, he won 30 states in the Electoral College, while Clinton won only 20. 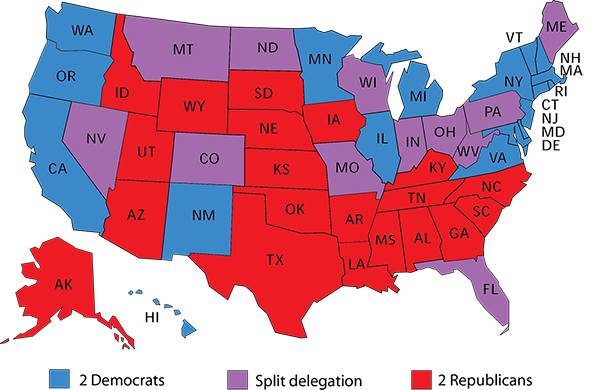 Because all states are created equal in the Senate, the median state in the Electoral College gives us a sense of the GOP tilt of the states overall. In ranking all the states by presidential margin from most to least Republican, the median falls between Arizona and North Carolina, which Trump won by an average of about 3.6 points, so presidential performance in the median Senate seat is roughly 5.5 points to the right of the nation. That's about the same Republican lean of the median House seat by presidential performance 9, the Hampton Roads-based seat held by Rep. Scott Taylor (R, VA-2). If a significant number of them lose to Republicans, it's hard to see how Democrats could make up that ground in 2020 or 2022 based on the seats being contested. Such is the GOP advantage, and the Democratic handicap, in the three Senate classes. 1. 10 Independent Sens. Angus King of Maine and Bernie Sanders of Vermont, both of whom are running for reelection next year, are members of the Democratic caucus and thus are counted as such here. 2. 11 This does not include the special Senate election in Alabama, which will be held in December.